We Drink Your Milkshake! : From The "I Can't Believe This Is A Real Movie" Files: BATTLESHIP teaser arrives! From The "I Can't Believe This Is A Real Movie" Files: BATTLESHIP teaser arrives! Not an actual movie set. Javi here. I know it's funny for me to make fun of a movie that's based off of a Hasbro property as is director Peter Berg's BATTLESHIP, considering I have a certain amount of love/hate relationship w/the TRANSFORMERS movies and GI JOE: RISE OF COBRA. 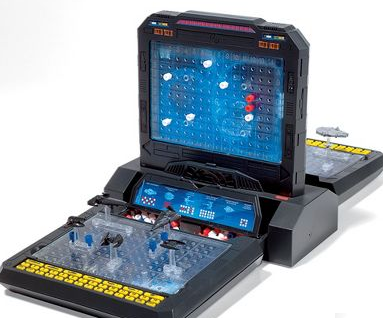 The only difference is that the previous two properties had fiction, BATTLESHIP is a board game. Where the hell are the red pegs? Anyway, earlier today Yahoo released the trailer. Check it out below. I'm sorry, I couldn't stop laughing at this movie,this feel like an MTV/Syfy version of both TRANSFORMERS and ARMAGEDDON, with the sub-plot of the hunky suitor that the father of the hot girl disapproves of. Even the freaking alien ships are almost complete ripoffs of the Decepticon fighters of TRANSFORMERS:DARK OF THE MOON. On the complete flipside, I am so amused at the fact that the aliens WANT to trap themselves with the navy ships in a space dome, that I want to go see this at the dollar theater. Leave your comments below, maybe there's something I'm completely missing here. BATTLESHIP is directed by Peter Berg. It stars Taylor Kitsch, Liam Neeson (why?! ), Alexander Skarsgard, Brooklyn Decker, Rihanna (well NOW I'm hooked), and Josh Pence. It comes out May 18th 2012.